Sir, — I am writing as chairman of Sonning Common’s neighbourhood plan revision working party to challenge the way South Oxfordshire District Council chose to conduct the recent consultation on its draft local plan and to question its purpose. The online form for submitting comments on the plan was, in my view and the view of many of those who grappled with it, intimidatingly complicated and laborious. The requirement for multiple references to the relevant headings and paragraph numbers in the plan, which, with appendices, runs to around 300 pages, made it both extremely time-consuming and technologically demanding to complete. Members of our working party made a huge effort to produce a one-page guide for submitting comments, which many Sonning Common residents, including myself, found invaluable. One of those involved in preparing it described the online form as “flaky and full of different font sizes, woefully lacking in clear guidance”. The undoubted effect was to put people off engaging with the process rather than to encourage them. I will leave it to the readers of the Henley Standard to judge whether that was accidental or deliberate. • Adopt overall housing targets way above the levels set by government. • Increase drastically the minimum densities for new housing developments. • Approve a number of massive developments in the green belt. Will those objections be listened to? Will changes be made to the plan to reflect those objections? Given the timescale that the council has imposed upon itself to get the plan approved and the complete indifference (bordering on contempt) that it has shown thus far to views different from its own, I fear the answer is “no”. Sir, — I would like to say that the news about the closure of courses and redundancies at The Henley College is absolutely devastating (Standard, March 6). John Howell’s comment showed no remorse for the jobs at risk and offered little support to this college. On his Facebook page he states: “More good news!! New figures show that the number of households where no one is in work has fallen to a record low. I would like Mr Howell to comment on the state of the local economy and publish some local information on Henley as I fear the national trend may not extend to our local community. What will he be doing to support The Henley College further? Will he be fighting in Parliament for greater support for sixth form colleges and schools? Sir, — The problem facing The Henley College (Standard, March 8) is partly the result of very limited applications for certain courses and the closure of these is understandable. However, overall government funding for further education has dropped by about 30 per cent since 2010 and government claims of extra funding go nowhere near redressing this shortfall in real terms. The issue of government expenditure on key areas of our national life is a crucial one. We face the situation where such areas are seriously underfunded and people suffer. The police, having had a 19 per cent cut in real terms since 2019, need an extra £400 million a year to meet current demands. The cost of meeting the requirements of these two key areas (£936million) is equivalent to just seven per cent of our annual overseas aid budget of £13billion-plus. Yet 36 per cent of our overseas aid is sent to organisations such as the United Nations and we have no control over where and how it is spent. In 2016, the remaining 64 per cent was sent by us directly to finance projects in individual countries. The foremost recipients were Pakistan, Syria, Ethiopia, Nigeria and Afghanistan — not countries known for incorruptible, traditional, democratic government. The reason invariably given by our politicians (including John Howell) for our huge overseas aid budget is that by giving we are helping to make the world a better place and this will eventually benefit us. However, perhaps the underlying reason is the political delusion of retaining a vestige of our imperial past. By giving to such an extent, the paternalism of empire is kept going. It is right to give properly controlled overseas aid but the inappropriateness and misuse that is clearly involved is indefensible. Sir, — Henley Conservatives are smart with Henley’s money. • YMCA: £100,000 was Henley Town Council’s contribution to guarantee that our YMCA remains, offering truly affordable accommodation to single 18-to 25-year-olds. This is the only YMCA in Oxfordshire. • Fair Mile cemetery chapels: £75,000 fulfilled the council’s responsibility to maintain these Grade II listed buildings. But our recommendation to set up a long-term fund to spread the cost of works and protect the buildings for the future has been ignored by the current administration. • Henley Cricket Club: £27,000 to give this very successful cricket club a more sustainable future by significantly lowering its annual maintenance bill. 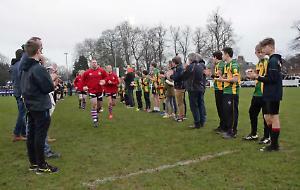 • Henley Rugby Club: £100,000 was the council’s contribution towards the clubhouse rebuild, which is not only home to the increasingly successful Henley Hawks but is also one of the biggest event venues in the town. Dry Leas is now a thriving, vibrant area hosting two additional successful businesses. Sir, — When Henley Residents Group regained control of the town council in 2017, one of its priorities was to deliver improved local bus services. It achieved this objective in August when the town council introduced a new Monday to Friday bus service. This service uses gas buses run on bio-methane produced from renewable resources. They are cleaner, producing no particulates, low emissions and 55 per cent less nitrogen oxide than the previous service. It was always HRG’s aim to extend the service but we needed to prove the five-day-a-week service was both financially viable and popular. I am pleased to say this service has been very successful. As a result, we are delivering against our aim and introducing a new Saturday service. It will begin service tomorrow (Saturday) from 9am to 2pm and will be free for the day. We encourage everyone in Henley to try it out, be they young, elderly or families. Hop on and hop off the bus or do a tour of the whole town to see the routes. Sir, — I couldn’t agree more with Ian Clark regarding putting Henley market place back to the way it was with two-way traffic (Standard, March 8). Sir, — Yet another brand new over-automated airliner hits the deck. It becomes more evident every time that pilots are outranked by computers with the blind authority to quite happily fly the aircraft outside of its flight envelope where no pilot, digital or human, can recover the situation. In many situations they can even override their human masters. A training captain once told me that he would never trust automation until somebody could prove the computer could look out of the window, sense fear and apply common sense. Power plus attitude = flight. Know your aeroplane. You do not need to know airspeed to fly an aeroplane safely, just put her the right way up with the right cuddle power and she will fly. Knowledge of speed just helps the fine tuning and there are many other parameters to tell if you are going too fast or too slow. In my day (18,000 flying hours’ worth) we would practice flying an airliner with one engine switched off (just to add to the excitement) and fly it home to a safe landing in thick fog with no knowledge of airspeed. What has gone wrong in today’s aviation? Automation breeds misplaced trust while airmanship and training practice wither on the vine of cost-cutting. Ah yes, but you don’t need to practice that because the computer is idiot proof and won’t let it happen. P.S. I hope addressing my aeroplanes as “she” does not upset anyone. What Tuesday night’s defeat for the Government in the House of Commons demonstrated more than anything else is the unsatisfactory nature of our adversarial approach to politics. It may well be that over the past two years the Government bungled its negotiation with the EU but what is certain is that it made no attempt to find common ground between the Leave voters and the Remain voters. There is no such thing as a country without all sorts of differences of opinion. There has never been and never will be anything that could be described as complete agreement but it is certainly possible to do better than has been done in the UK to achieve some degree of consensus over Brexit. But no attempt was made to do this. Instead, our politicians carried on ridiculing each other. Is there anybody in this country who really feels that anything is actually achieved by the manner in which Theresa May and Jeremy Corbyn fling insults at each other across the dispatch box? Of course, this does not only apply to Brexit. It is also disturbing to see the BBC interview individuals who maintain that the UK should leave the EU precipitously without any concern for the consequences. This is not an indication of a malicious unconcern for the harm which such an event might bring upon individuals in this country. What such statements prove is what a very poor job the Government did in explaining to the population the consequences of a major disruption to trade which an unmanaged Brexit would cause. The UK is indeed in a difficult position. Our adversarial political culture has allowed extraordinary claims to be made for events like delaying our departure from the EU or for having a second referendum. The notion that either of these would have catastrophic effects on our democratic culture is simply nonsense. Our belief in freedom of speech has allowed individuals to make all sorts of claims for which there is no substance and because of the adversarial postures neither side is prepared to believe the other and this clearly cannot be good for the UK as a whole. Is it not time for grown-up politics to come of age and a more mature approach to trying to achieve consensus in our society? Is it not possible to find in people who are not dug into the trenches of one side or another and who could be able to conceive of a path out of this quagmire we have got ourselves into? I saw with interest that Henley’s MP John Howell trooped through the division lobbies in support of the Prime Minister’s dead duck Brexit deal. Sir, — For those MPs in favour of Brexit, it isn’t an economic project, it is about imposing an illiberal project on the people of this country. Jacob Rees-Mogg says in 50 years it will have been worthwhile. The truth is most professional and entrepreneurial people are liberal-minded; we want everyone to prosper. We have helped and are proud of helping thousands of people to improve their lot and that of their families. This Tory Brexit which John Howell MP now supports is inimical to these liberal values and the fact is that the population in his constituency doesn’t support it. Numerous people like me and my family who used to vote Tory feel very cross and completely betrayed. Mr Howell is unwilling to represent the views of the people of Henley who, in a considerable majority, are against Brexit in any form. My wish is for every community to provide a dementia friendly (memory) café offering encouragement and support to carers and their loved ones and signposting the folk to appropriate professional help and advice. I have now had the opportunity to scrutinise the judgement of the Appeal Court in relation to the case of Wokingham Borough Council and Harehatch Sheeplands owner Rob Scott and others. I am astounded at the damning indictments in relation to the conduct of the council and some of its staff. It is blatantly obvious to any rational person that a number of council employees have gone far beyond what was required to protect the green belt — so far, in fact, that questions must be raised as to their true intentions. Despite claims to the contrary, the council has attempted to frustrate the operation of this lawful business by any means possible over a long period. This fact was clearly not lost on the court with the judgement containing such phrases as the council had “induced Mr Scott to act to his prejudice”, and he had been “denied the opportunity to have the matter tested in the appropriate planning forum” while the council “had sought to take advantage of the situation… without the recourse to the appeal process”. In its dealings with Harehatch Sheeplands, the council seems to have totally lost sight of the fact that it is there to represent the interests of the residents — interests that were expressed by 12,000 signing a petition in support of the business. The individuals involved have acted in a thoroughly disreputable and unprofessional manner, which has brought the garden centre to the brink of closure, rendering 100-plus individuals unemployed and decimating a valuable local amenity. Rob Scott has gone public in saying he would like to rebuild his business, Harehatch Sheeplands. • Local people loved and supported while more than 12,000 signed petitions to keep it going. • Employed more than 100 local people until most lost their jobs. I hope that in the future all Wokingham Borough Council’s dealings with the garden centre will be harmonious, so that this precious place can grow from strength to strength. I was at the meeting of both the council and its executive last month. I listened to Christopher Neale’s question regarding the Appeal Court’s ruling that the council had “not acted with integrity towards Mr Scott” but in a way that was “unjust and unfair”. Councillor Simon Weeks replied that focusing on court processes missed the point that the council had protected the green belt from unlawful development. He is clearly blinkered and missing the point. Spending more than £72,000 of taxpayers’ money on court processes is okay? All those local people losing their jobs is okay? Making a businessman nearly lose his business and home is okay? At the second meeting, Philip Meadowcroft asked us to focus on the implications of what the three Appeal Court judges said. He also quoted the “unjust and unfair” comment made by the judge and mentioned the damning email evidence of the exchanges between members and officers over a lengthy period. He asked Councillor Julian McGhee-Sumner to give urgent consideration to suspending from office all those members and officials named and shamed by the court. At the time, Cllr McGhee-Sumner felt he could not comment until he had read the transcript of the court’s ruling as it had not been released but said the council’s barrister had not felt there was anything untoward. The transcript is now in circulation and I am sure everyone has had time to digest it. It is time now for those members and officials to be called to task. They have acted in a totally unprofessional manner that reflects poorly on the council. As a Henley IT company, we are always trying to keep local residents and businesses as safe as possible from security vulnerabilities. There is a new vulnerability that is exploiting those running Windows 7 and the Google Chrome browser. We are desperately trying to reach as many people as possible to keep them safe. Thousands of people and many, many businesses in Henley are still running Windows 7 and are at risk. Please help us get the message out as this isn’t headline news nationally and it should be. Spring is nearly upon us — it is getting warmer, the sun is shining, the sky is blue and the rhododendrons, azaleas, daffodils and tulips are popping up to say hello. I love spring and the colours and aromas. But, most of all, I love Henley’s May Fayre! And we are back with a bang in the Market Place this year, Monday, May 6 from noon to 5pm. It will be a fabulous fun family day, kicking off with the maypole dance at noon followed by musicians, dancers, performers and other “local” acts on stage throughout the day. There will be some amazing traditional stalls, selling everything from cupcakes to children’s toys, plus vintage fun fair games, face painting, Jackanory, tug of war and so much more. We are kindly supported by Henley Town Council and sponsored by Wilkins (Henley), Penny & Sinclair, Soha and Hot Gossip, for which we are incredibly thankful, and will be raising funds for the Henley Stroke Club. But with all this happening, we do need a bit more help than last year. Will you be one of a handful of helpers to come on board to help make this May Fayre bigger and better than last year? It would be good if we had support from all parties on the town council and, of course, anybody else who would like to help out. The more the merrier. Sir, — I would like to thank you for your excellent support with regard to encouraging Henley Town Council to repair the public slipway in New Street. The works were recently completed and well in time for the various river events, starting with the Chelsea Fringe Henley floral flotilla. P.S. See you all on the river! Sir, — Last week, Fr Paul Fitzpatrick wrote about the Lent season. Churches Together is running lunchtime services at Christ Church, focusing on the unique accounts of Christ’s Passion in Luke’s Gospel, each Thursday until April 11, starting at noon, followed by a simple lunch at 12.30pm. Christ Church: Life explored — Tuesdays at 7.30pm until April 9. Sacred Heart: Lent talks focusing on the Eucharist. Daily 7.30pm until April 12. St Mary’s: Reading group in the Chantry House, Fridays at 8pm. Holy Trinity: In the vicarage — Wednesdays at 2pm until April 10. Editor, — I would like to thank Caroline Beard for her letter (Standard, March 8) in reference to my Nature Notes column of February 15 where I attempted to discover the true reason for the creation of the cross of oak trees within Henley Park. A Maltese Cross is indeed of the same design and shape of both the Iron and Victoria crosses. If she is correct it would be quite wonderful to learn the name of the gallant individual that perished in the service of his homeland. However, and with due respect, my work with Dave Kenny was specific and our dating of the trees was as accurate as possible. Sir, — I wholly agree with my friend Bob Peterson’s opinions about dropping “Sir” as the form of address when writing to the editor of a newspaper, or “Madam” if it is a woman (Standard, March 8). As he says, it shows respect, an attitude sadly lacking among some people today. I speak as an 82-year-old woman who, despite working in a largely male environment, never experienced any form of harassment when young and attractive (I can say this, as I am by no means attractive now). Kindness, tolerance, respect and thoughtfulness are the key to the future of the human race and all these qualities are to be found in nearly everyone. • The letter from Councillor Ian Reissmann published last week stated he is chairman of Henley Town Council’s finance strategy and management committee. He has asked us to point out that in fact he is vice-chairman and that the error was ours, not his.